Thirst. 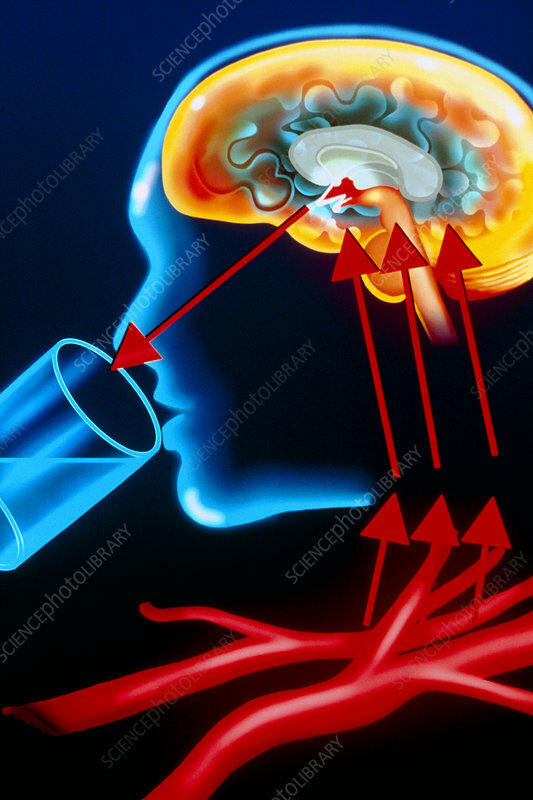 Artwork showing the brain processes that lead to the sensation of thirst. Thirst is a desire to drink more liquid. The body has to maintain a constant concentration of salts and sugars in the blood, and it does this by either excreting liquid (urination) or drinking liquid. When the salt and sugar concentrations are too high, the blood in the blood vessels (red, lower centre) in the hypothalamus in the brain (red, upper centre) stimulates nerves which bring on the sensation of thirst. This typically manifests as a dry mouth and an inability to pass urine. Drinking water quickly alleviates the symptoms.